Welcome to the third lesson in MEI’s Grammar Workshop series, our bitesized series of tutorials that will guide you through the grammar wilderness. Today we’re looking at the colon. Visually, the colon consists of two equally sized dots centered on the same vertical line and is most commonly used to provide a pause before introducing related information. For example, the sentence “A pizza is made up of three parts: a base, the sauce and the cheese” is grammatically correct. The first part of the sentence informs the reader that there will be three parts to a pizza; the colon implies “here are the three parts”. 2. If you see unsafe behavior, report it to the lifeguard. 3. Did you remember your towel? So there you go! 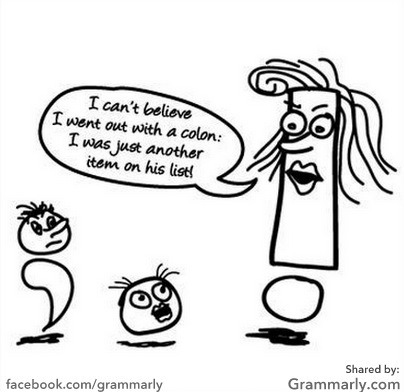 Colons are used in other contexts too but this’ll do for now. Questions in the comments below, and please Like and Share to spread the grammar love.